Mattresses are huge! So, when it is time to replace your current mattress with a new one, what do you do? Do NOT just put it out with the trash! In many municipalities, this is against regulation and you may even face a stiff fine. Once a mattress has served it usefulness it is not easy to dispose of especially for those living in Long Island or other parts of NYC. No one wants to store old dirty mattresses in their apartment or home forever and getting rid of those useless mattresses is no easy task. Improperly disposed of mattresses are an eye sore, cluttering up alley's and serving as a home for rodents and other pests. In addition, poorly disposed of mattresses poses a number of health and safety risks for the community. 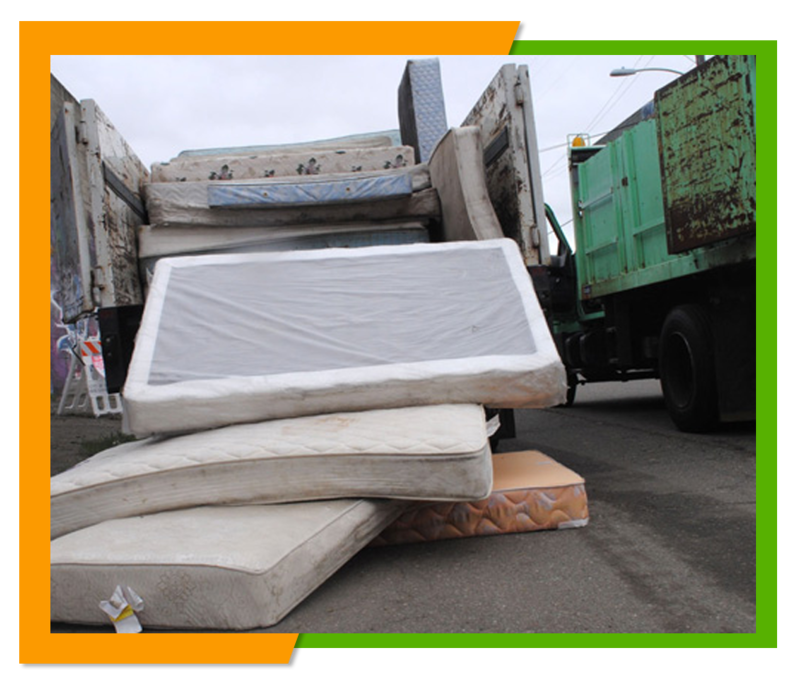 To make matters even more difficult NYC has strict mattress disposal guidelines you must follow in order to avoid stiff penalties and fines. In addition, removing bulky mattresses from walk up apartments can be labor intensive and physically dangerous. Not everyone has the ability or the means to follow those guidelines to the letter to insure that you don't accrue heavy fines or penalties. At Flat Rate Junk Removal we can remove all those old worn or bedbug infested mattresses for you safely and easily. We provide a two man crew and our trucks can carry a maximum of 24 cubic yards so we can remove one or several mattresses for you. 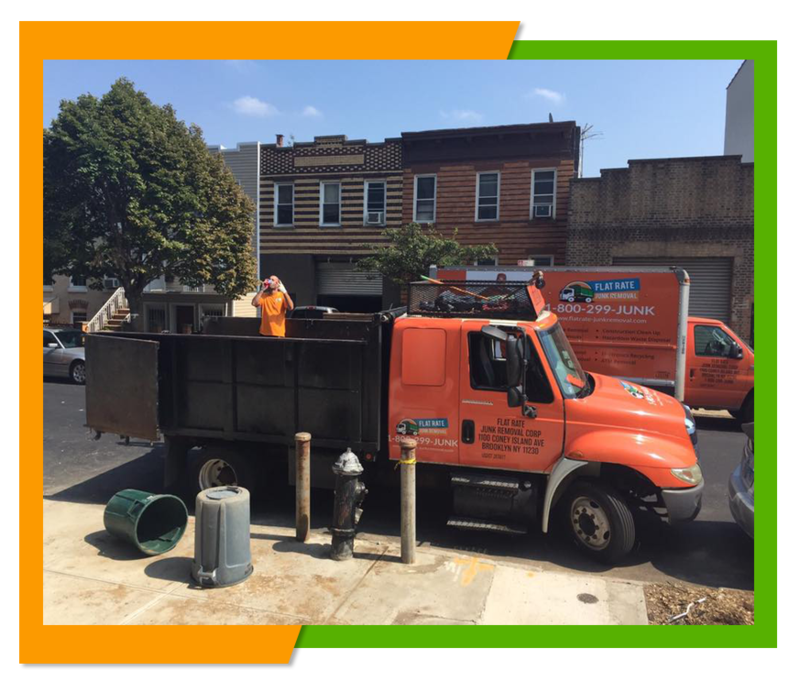 We will come to your location and all you have to do is point out the mattress or mattresses that you want to have removed and our crew will collect that mattress for you and dispose of it according to to Long Island mattress disposal guidelines. You won't have to worry about improper disposal causing health risks or resulting in large fines because we know what we are doing and have the means and the knowledge to remove all types of junk and debris from your home including those old mattresses. We provide mattress removal for both residences and commercial business such as hotels and motels, boarding houses and hospitals as no job is too large or too small for our skilled and knowlegable crews to handle. So if you are ready to get rid of those mattresses why not consider calling our expert junk removal team to help you accomplish your goal? Our convenient flat rate fees makes it easy for you to know the cost of your mattress removal up front with no surprises for you. You can check for pricing here on our website at www.flatrate-junkremoval.com. If you have any questions about our services or prices or want to get a free estimate or schedule an appointment you can do by calling our personal representative at 1-800-299-5865. Although we are based in Brooklyn we will see to the mattress removal needs for anyone living in NYC. We are not just a mattress removal company, we remove all types of junk that you no longer want or need so if you are looking to remove any type of junk from your home, office or apartment why not give us a call at 1-800-299-5865? We will more than happy to be of assistance to you. Call us 7 days a Week 8 a.m. to 8 p.m.